The ionizing bar EI W is a new development combining the highest output with excellent mechanical stability. At the same time, the modular design of the system ensures a high degree of flexibility and serviceability. The EI W eliminates disturbing electrostatic charges at twice the rate of the previously most powerful ionizing bar. This ensures a high level of effectiveness and reliability even with fast-runnning machines and high electrostatic charges. The modular design of the EI W allows straightforward and fast replacement of the ionizing pins. Stainless steel pins are used as standard. For special applications such as the use of the EI W in semiconductor manufacturing, ionizing pins made of silicon are also available. 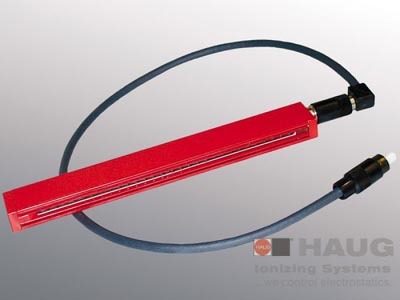 service friendly: The HAUG ionizing bar EI W consists of individual modules; each part is exchangeable. The high-voltage cable can be extended, shortened or replaced. further reaching: The increased output means that the ionizing bar EI Wcan be installed further away from the material, if required. process compatibility: The material of the ionizing pins can be selected specific to the application. In semiconductor manufacturing, for example, the risk of contamination can be reduced by using ionzing pins made of silicone. Plastic processing industry: film processing, packaging machines, film extruders, etc. Textile industry: weaving mills and spinning mills, textile finishing etc. Graphic industry: screen and pad printing machines, photo and film processing machines, folding machines, etc. Paint shops: automozive painting, painting of plastic parts, etc.